One of the best things about the German language is that they have a word for nearly everything. For example, verschlimmbessern, which is used to describe someone who has made something worse in an honest attempt to improve it. As far as I know, however, they lack a word to describe a feeling of déjà vu that’s quickly vanquished. 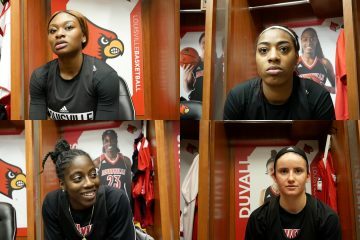 Well, get on it Deutschland, because that’s how Card Nation felt midway through the Louisville women’s victory against Florida State on Thursday night. 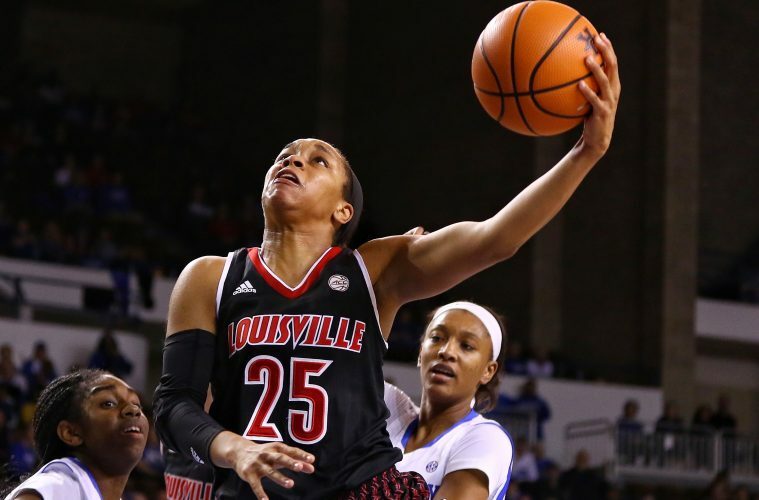 The eeriness was palpable in Jazmine Jones’ hometown of Tallahassee as the Cardinals jumped out to a 20-6 lead over the course of a first quarter which featured an 11-0 Louisville run. Florida State would shoot a dismal 21% from the field in the opening segment and things looked bleak for the Seminoles. But any Louisville fan who attended last year’s collapse at the KFC Yum! Center was by no means counting the eggs prior to the pudding. Whereas the first quarter featured zero fouls in the first five minutes, the referees manged to cough up their whistles in the second. 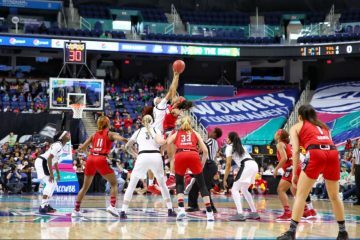 And although neither team would score for the first four minutes of the quarter, the remaining six minutes would see Florida State finding the stroke to improve their shooting from 21% to 30% in the course of ten minutes. 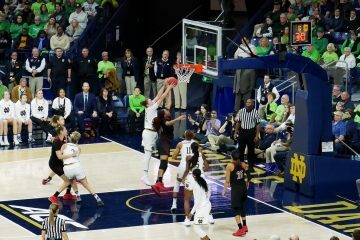 Sam Fuehring picked up two quick fouls in the span of a minute, and the Seminoles would finish the quarter outscoring the Cardinals 17-12. Meanwhile in Louisville, digestive tract exits began to pucker. Durr would go on to dominate the narrative with a 29 point, 7 rebound night. In fact, she was second in rebounding only to her teammate Kylee Shook while out-rebounding all individual efforts by Florida State. The ups and downs of Louisville rebounding ended on the upside tonight as the Cardinals would dominate the glass 37-25 for a +12 margin. Caution was the only thing that kept Durr from even more impressive figures. With about two minutes to play she went down hard from a clothes line tackle on an attempted layup. While she got up and brushed it off casually and hit her free throws, Walz decided that was a good time to bring in the cleanup crew. Louisville has now held their past four opponents to less than 50 points. Juniors Gillespie and Ekhomu would lead the way with 13 and 11 points respectively for the Seminoles, but this would easily be outshone by the Cardinal’s 56% from the field featuring 5 for 11 from three point range. The bright spot for Florida State would be their 10 steals, while Louisville would turn the ball over 17 times on the night. But FSU’s cold stretches, especially in transition, would make it difficult for the Seminoles to close the gap. Top honors go to Kylee Shook, who would play 27 minutes while holding court after Fuehring’s two quick second quarter fouls. Her eight points and nine rebounds were marked by aggressive play in the post. 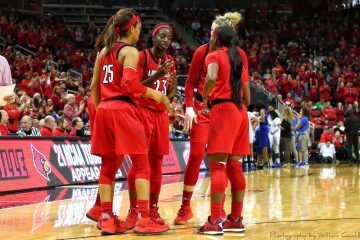 Strength and aggressive play have been lacking for Shook this season, often deferring to Sam, Bionca, and Jazmine for such contributions. Perhaps it was the bleeding gash that Kylee received across her left cheek early in the game that awoke the spirit of Diana within her, but regardless of the impetus it was impressive to watch. The Cardinals improve to 18-1 and 6-1 in ACC play, while picking up a quality road win against an RPI top-25 opponent. But perhaps the more satisfying aspect is the exorcism of the FSU demon that has plagued Louisville over the past two years. The mood in Tallahassee was certainly personified by Jazmine Jones’ family, who offered up a respectable home-like atmosphere for the Cardinals. Fortunately the Cards will return to their natural home this Sunday with a match against the Pitt Panthers scheduled for 2:00 PM at the KFC Yum! Center. Looming on the horizon? A showdown with UConn one week from tonight.